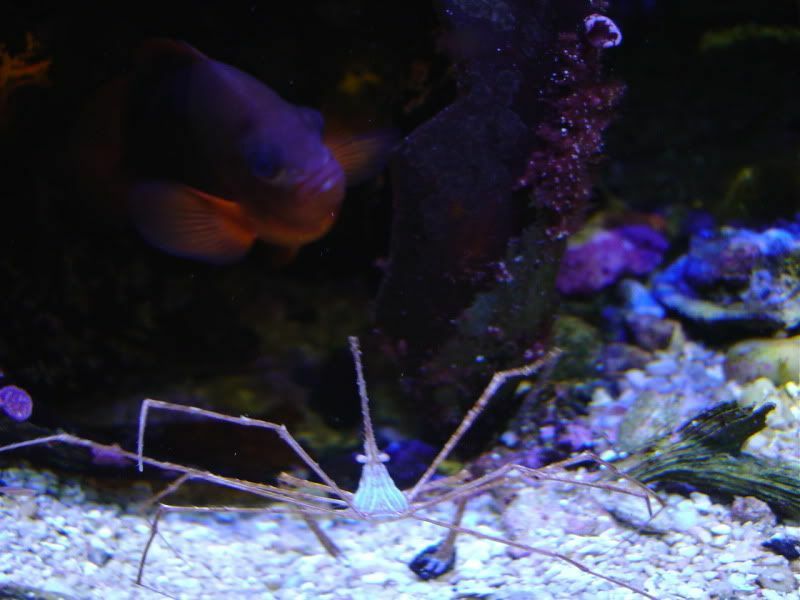 My arrow crab has a little nose cyano problem. Fireclowns spawned again last night. I think they spawn every month or five weeks. I don't get to excited when clowns spawn because they will spawn by eating cardboard as long as you put a picture of a worm on it. I am a little excited that he is about 25 years old and she is about 17 or so. I really don't know how long they live but it's probably around 30 years. 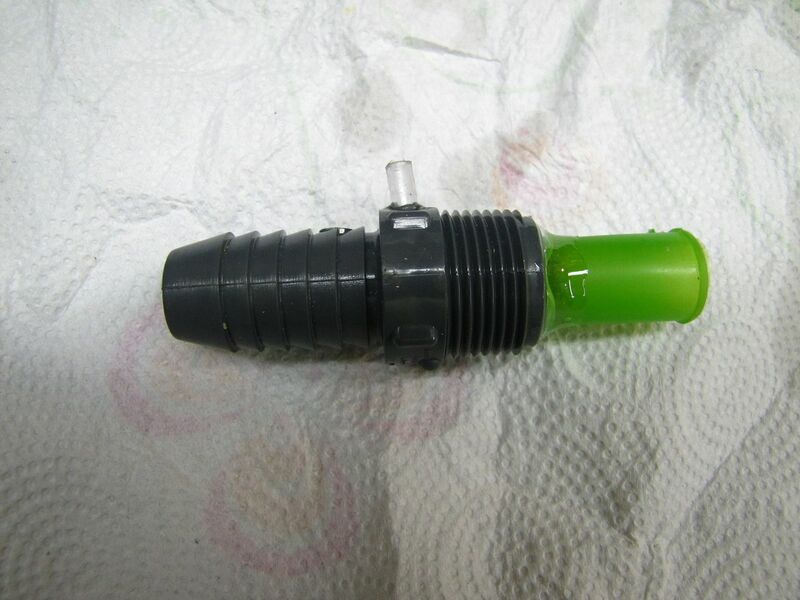 I designed a slightly different venture valve for my DIY skimmer than the one I was using. 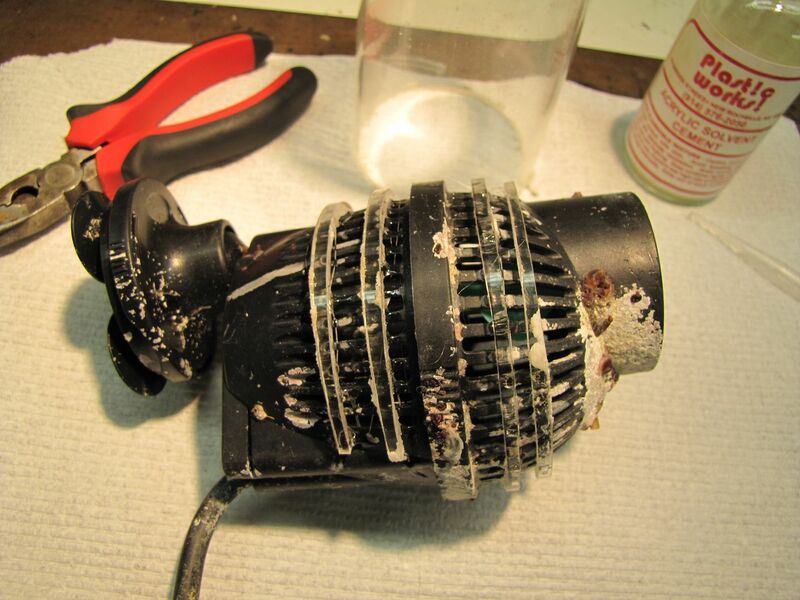 My existing one used a neoprene washer inside and after many years it rotted. This one has a better design inside and has a smooth bore and a better method of producing small bubbles. I know it works better because as soon as I turned it on, my skimmer overflowed all over the place. It cost about a buck. My 2 year old Cobalt, how ever you spell it, died. I really hate these things. Not just that one but all new pumps. My original, (American Made) pumps lasted for over 20 years, some 30 and some are still running from the 70s, non stop 24/7 with no problems. This one that died. This one worked well for the short time I had it. It was a low voltage DC job. I tested the power supply and it is good. Then I cut the wire just before it went into the motor and it was getting power so I know it is toast. 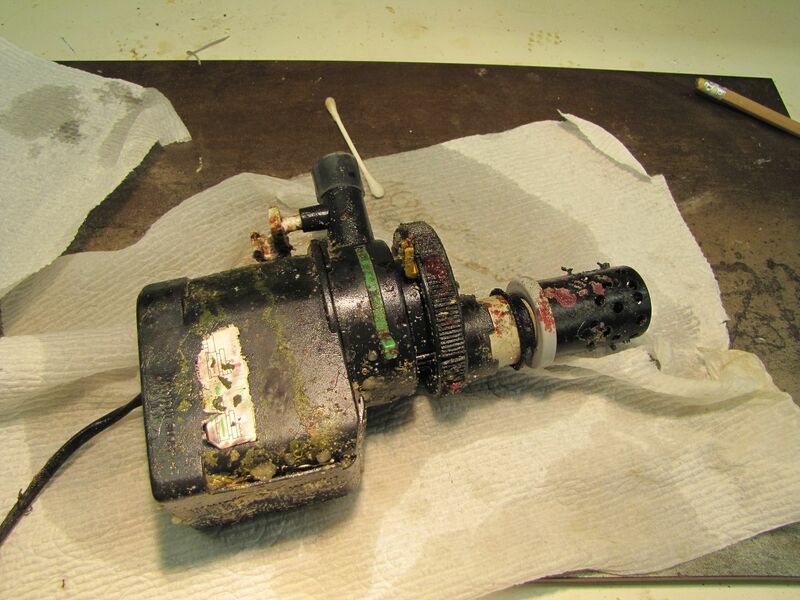 I have a pump running my skimmer that is under my tank so I never see the thing. It is the oldest pump I have and I don't know the model and I can't see me crawling under there with a flashlight to look at it. If I shined a light on it, it may explode. I ordered a new pump, I forget what kind and I don't think it matters because I think they are all made by the same guy in China. If I could find an American one, no matter how much it cost, I would buy it. But unfortunately there is no such thing and we are stuck with this kind of stuff. Today I was cleaning out my garage and I came across a box that I had not seen in years. It was from our wedding shower. We have been married for 44 years so it is old. It is a avocado colored food mixer. In big letters it reads "Made in the USA" so I know it is old. It is still brand new in the box and was never taken out. This thing is still running but it is only a few years old. I think I am going to go back to these. I had 5 or 6 of them and they all lasted over 20 years running continuously with no problems. You don't even hardly ever have to clean them. The Propeller ones like the one that failed need a lot of maintenance and they don't last long at all. They also cost more. I went to vote today in the New York primaries and when I went to the normal polling place, it was closed. So I called my town to ask where the voting place was. A woman got on the phone who barely spoke English and told me she didn't know where I should vote. This was the number you call for town information. So I went to my Village office and they said you vote right here. I said, How am I supposed to know that? She said, there is a sign on the pole out by the street. I went and looked. 100 yards away on a light pole there was this 8"X8" paper sign that said "No Parking, Polling place". This guy stopped eating today which means he will molt in a day or two. Not a minute to soon as he is becoming to be covered in some algae and a little cyano. After he molts I will look for a female for him to date as I want them to mate. 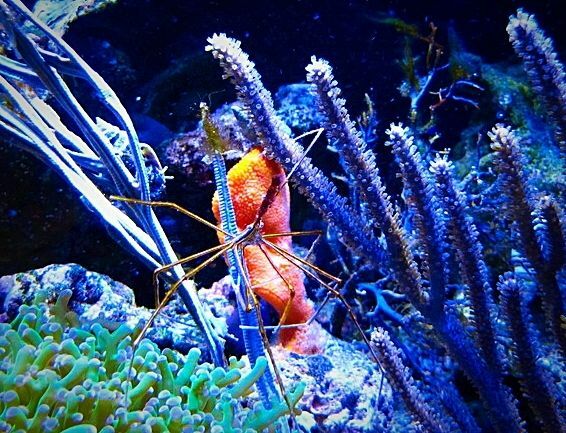 I have had arrow crabs mate a few times and it just seems right to get him a girlfriend to try to impress. I got him as a baby and I think he is now ready. That arrow crab shed as I knew he would and now he is much larger. So much larger that I am afraid to go to sleep at night as he has been looking at me funny lately with those beady little eyes. I think he is mad that it is taking me so long to find a suitable mate for him but I am looking for a real cute one, sort of like a Crab Supermodel, so it is taking a while. I find that crabs seem to live forever and that the only time one would die is right after they shed and another creature finds them tasty. I am sure the numerous bristleworms I have smell him and chase him around right after he sheds. If he sheds on the gravel, they will surround him and possibly trip him so that when he falls down, they put him in a Ricky Nelson. 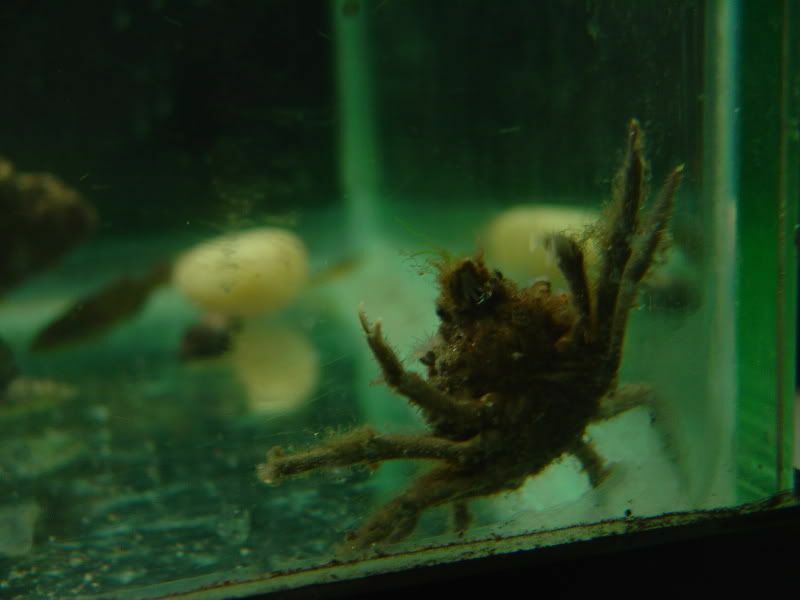 I also have some large hermit crabs that I got the size of a pea. Those too live forever and I lost a pair a few years ago that were about 12 years old. They died a week apart. These guys lived to 12 years old. The female is the cute one with the above the knee shell and blue eye stalks. These local New York rock crabs you can collect here all over the place. They grow to about the size of a baseball in a year so you can't keep them to long. It seems that my clownfish spawn almost exactly every 30 days that I notice. They may spawn twice as much as that but I don't notice. The bluestripe pipefish are harder to tell because the male always seems to be pregnant. 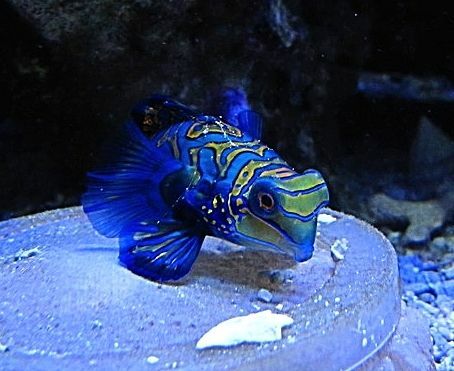 The mandarins sometimes go through spawning every couple of weeks to a month or more. It is very hard to tell because those, and most fish spawn just before the lights go out. 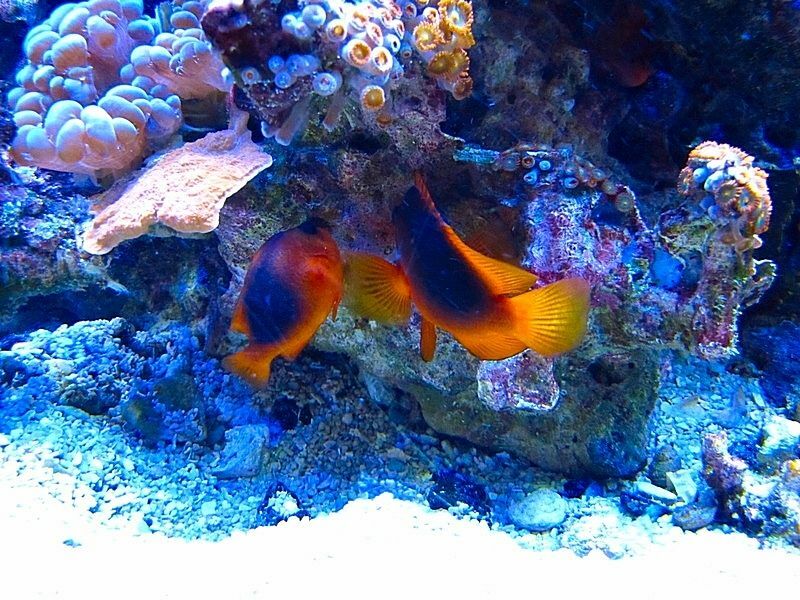 Bangai cardinals need a lot of food to spawn and it is hard to feed them enough in a mixed reef tank. Them, like Moorish Idols lose length on their dorsal fin when they don't eat enough and they will stop spawning. The two adults I have can probably eat more by themselves than all 20 of the rest of my fish with the copperband being second. If I fed them as much as I really should, they would spawn every couple of weeks like they are supposed to but I just can't put that much food in the tank every day or I would be changing the water twice a day. 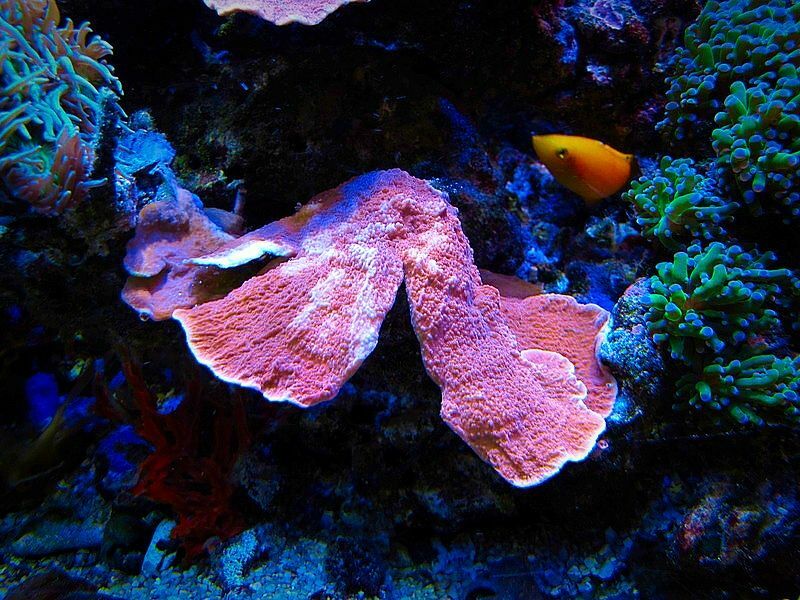 Feeding correctly is always hard in a tank full of corals. My nitrates are already way to high but I really want all my fish to spawn so my SPS will just have to get over it. This has always been a problem and as you know, fish grow. And sometimes they grow much larger than we would like. Or I could just let them live in my freezer. My largest montipora coral is bleaching. It is only that one and this is the third time this has happened. It seems after they grow huge, they get bored and start to bleach. I have no idea why and the rest of them seem fine. The last time this happened I had a piece that grew from fingernail size to about 10" round. Then in 2 days it turned white and croaked. It is happening again and I find it interesting. I wish I knew what was going through their head as to why they do this. But it is what makes this hobby so much better than stamp collecting or trying to guess the phone numbers of Supermodels. My montipora actually looks a little better so maybe it is just teasing me. The fish are all great, but as I said to big and they seem to like being pregnant. 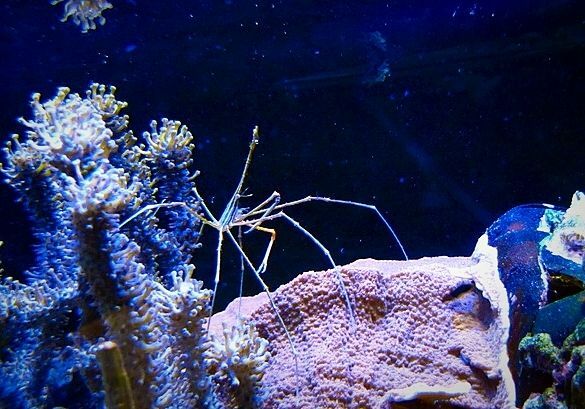 My arrow crab is still scary and I hope he also stops growing. Another molt and he may break the glass. I can't seem to find my clingfish but he shows up every few weeks and also gets bigger. Tomorrow I have to buy more chowder clams as that is my preferred food that they get almost every day along with the worms and new born brine. If it were not for the bluestripe pipes, mandarins and anthius I wouldn't have to hatch those little suckers every day. But if you want to keep such creatures you need to do that. No, you can't have long term, pregnant mandarins and pipefish by feeding pellets even if they will eat them. Your fish will hate you. I just read some older posts on this and other forums and it seems that a lot of people feel they can't use my methods to keep fish immune or pregnant. I am not sure why because for the first 40 years I had my tank I also had a regular job and still had time to properly feed my fish. Maybe like I keep hearing, I am just lucky. Yesterday I tuned up my boat. I can't remember the last time I put spark plugs in it and I mentioned that to the mechanic at the marina. 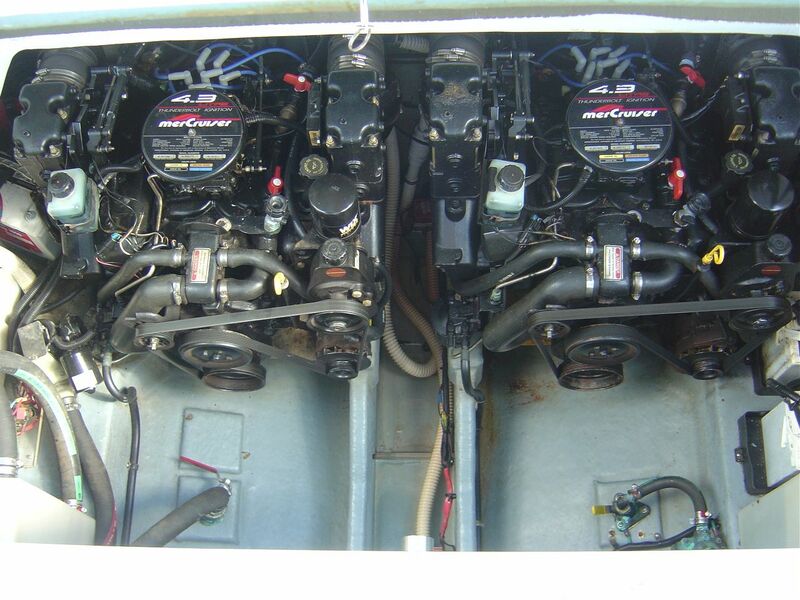 He told me that after a few years in salt water you can't get the plugs out any more and they have to pull the engines out for $4,500.00 He must have me mixed up with a Jiboni because if I spend $4,500.00 on anything it better involve Christie Brinkley or any one of the Victoria Secret Supermodels, Hawaii or Tahiti. The plugs came right out because the last time I changed them I put some anti seize compound on the threads. If you do your own work you know what you are getting and won't have any problems the next time. The job cost me $36.00 and took an hour. The actual work was probably 20 minutes and the rest of the time was spent trying to straighten myself up after cramming myself in between those engines. That montipora that was bleaching seems to be almost fully recovered. That is weird but I think I figured out what was making it fail to thrive. I tested my Alk, something I rarely do, and it was high. Higher than my test kit goes which was 13. So I just dosed calcium maybe 6 or 7 times with no alk and the thing looks much better and almost back to normal. I didn't test the alk again but I assume it came down. I once lost a very large monti by bleaching and was wondering what the alk was then. I think in a few days it will be as good as new. My fish don't seem to care and continue to smile, and spawn. The white parts were very white a week ago and I was sure it would croak. Very interesting article, well written. Did you find you missing clingfish? I don't see him yet but even when I did see him it was only his mouth as he hides all the time and never comes completely out. I am sure he is partying in there someplace. 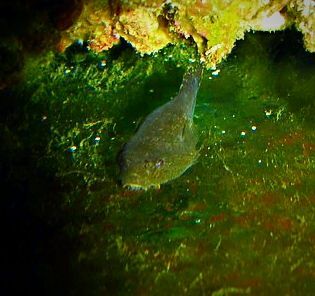 I found my clingfish today as I was cleaning the sponge that strains the water that goes to my reverse UG filter. He disappeared for a few weeks. He is happily grazing on the "mulm" that grows on the back of my tank. I knew I would find that little sucker. Today I noticed my tank had only the blue LEDs lit. My new water cooled home made fixture had a problem. It has worked flawless since I built it but I used old LEDs from an old fixture so I figured at some point there would be an issue. 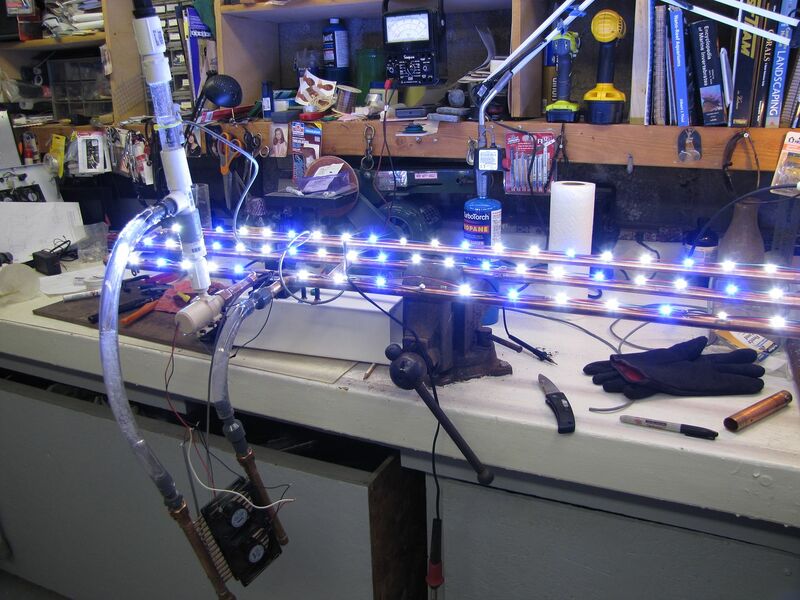 I tired to fix it while it was on the tank but that was difficult because it was hard to test each LED while suspended over the tank and I really didn't want to remove it because it is 6' long and connected to a water pump and radiator. Luckily when I built it I installed unions so I could fairly easily remove it and the electrical parts unplugged. So I drained it and removed it from the tank so I could work on it on my workbench. It took over an hour to repair because two LEDs were faulty. If it was only one it is a lot easier because it is just a question of testing each one in series, but when more than one is bad, it adds some technical issues. I replaced the two bad LEDs and re-glued some reflectors that came off. I also cleaned and polished the splash guard which needed to be done anyway so now it is as good as new. Until another one goes out. This is the fixture under construction when I first tested it. 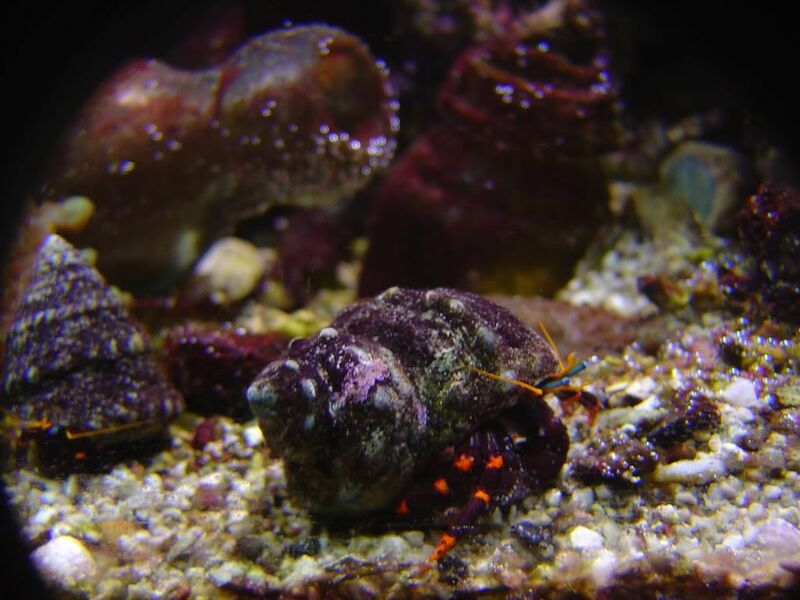 I am glad that I found a new reliable source for clams to feed my tank. 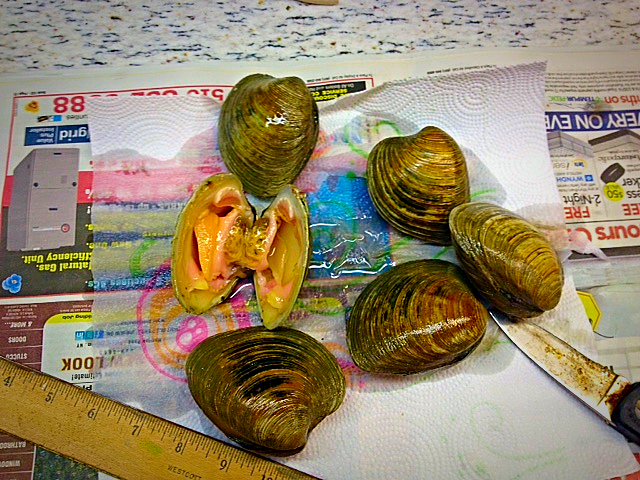 They sell clams all over the place here on Long Island but sometimes the larger ones are hard to find. I ran out of them for a week and my fish were carving Human Racial Slurs at me on the glass. But now they are happy. I have been looking for this little pipe for weeks and couldn't find him. I figured he croaked. But he came out all smiling and happy looking. Who would have thought? I would want to eat there.